Located in the famous Cospillot area, the cosy and sophisticated chalet White Dream can welcome 10 adults and 2 children in 6 bedrooms. Beautifully complementing the snowy white scenery, this stunning chalet sits nestled between pine trees and boasts not only beautiful unobstructed views of the mountain but also all the amenities that you could possibly need. Chalet White Dream features the most high-end facilities including a swimming pool, jacuzzi, fitness room as well as a home cinema, bar and large fireplaces throughout. The living room is on the second level of the chalet, accessible by elevator, is the first of two lounges in the property, the second, located on the lower level of the chalet offers a glass bar with inlaid lighting that gives an ice effect. 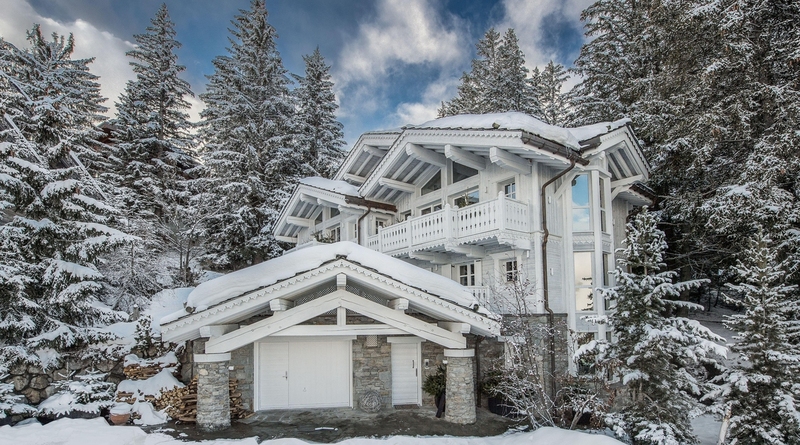 The White Dream chalet in Courchevel is a great chalet for well-being and will appeal to those looking for an abundance of facilities as well as ultra-luxurious interiors. -Leisure areas with comfortable sofas with home cinema TV, bar and an office area with a computer. -Swimming pool dimensions: 7,50m x 4,50m x 1,50m. -Living area: The living area offers a beautiful unobstructed view on the mountain.